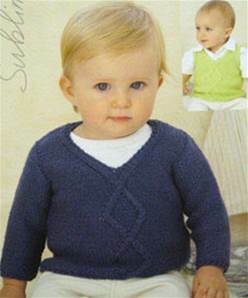 Sweater: 41cm 2 balls, 46-51cm 3 balls, 56cm 4 balls. Slipover: 41-51cm 2 balls, 56cm 3 balls. Based on 50g balls Cashmere Merino Silk DK. DK tension 22st/ 28 rows to 10cm, 4mm needles. Recommended yarn Sublime Baby Cashmere Merino Silk DK. 3.25mm and 4mm needles, st holders.